You deserve quality representation, but not every Lawyer can deliver it. If you need to speak with an experienced attorney that understands how to guide you through your legal situation, please schedule a consultation or give us a call today! Lazares Law is located in Tacoma, Washington, and serves clients in Pierce, South King, Kitsap, and Thurston Counties. I have over 30 years of legal experience, including extensive trial work. I pride myself in providing counseling and legal services addressed to the individual needs of each client, and delivering those services in an affordable manner. Competence: Does the attorney have significant experience and success in that area of law? Confidence: Does the client have an abiding feeling that they are in good/capable hands? Communication: Does the attorney help the client understand the law concerning the case, answer all questions, promptly return telephone calls, and regularly update the client about the case? I was hit head-on. You took my case even though the other driver had no insurance. You worked tirelessly for me, resulting in a substantial settlement for me. I always felt that me and my case were important to you. Thank you for your integrity and tenacity and for fighting so hard for me. Thank you from the bottom of my heart. YOU ARE AMAZING! 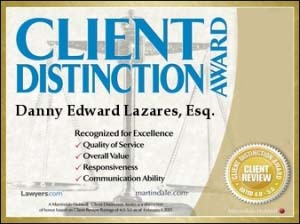 I would highly recommend that anyone that has an injury case to hire Mr. Lazares. Although my case was not very big, he made me feel as if I was as important as if it was big. He was able to settle my case without filing a lawsuit and the amount of my settlement was much bigger than what I had expected. He’s a great lawyer! Mr. Lazares is very knowledgeable about Landlord/Tenant Law, but is also willing to entertain alternative solutions to cases that can be very emotional. When I see his name on the pleadings, I know the matter is going to be handled professional and collegially and I always appreciate that. I endorse Danny! Dan is a fierce advocate that is as knowledgeable as they come when it comes to Plaintiff’s personal injury cases. Every Judge in Pierce County knows and respects Dan Lazares. Dan’s word is his bond and he is as smart as he is tough. Did a fantastic job helping us out of a difficult situation. Was very professional and prompt with all questions we had. Got what we needed done in a timely manner without any problems on our end. Would definitely recommend to anyone who needs this type of assistance. 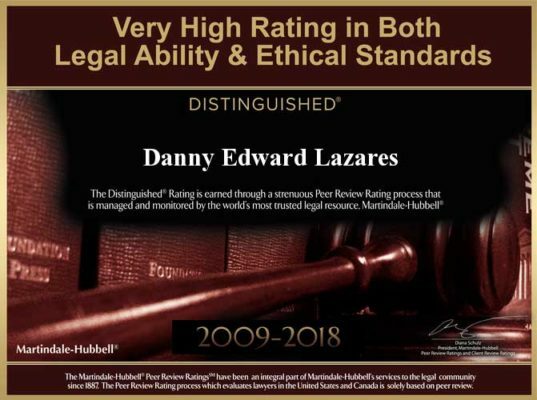 I give the highest recommendation for attorney Dan Lazares. After I became unhappy with an attorney who was representing me, he took over my case and finished it quickly. He kept me informed as we went, and the result was exactly what I had hoped for.